Home » Mid Century Culture » time capsule homes » Glorious 1970 time capsule house interior design — in a house barely lived in for almost 50 years! 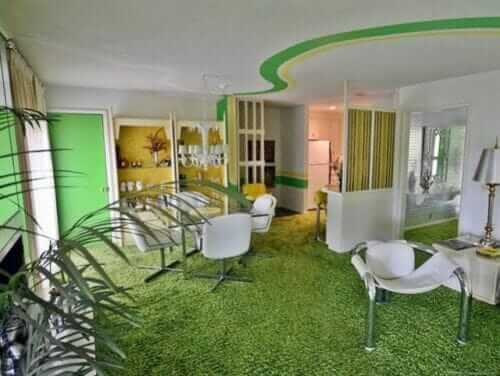 #1 (above): Oh my word, the lime green and yellow striping that leads you through the living room. 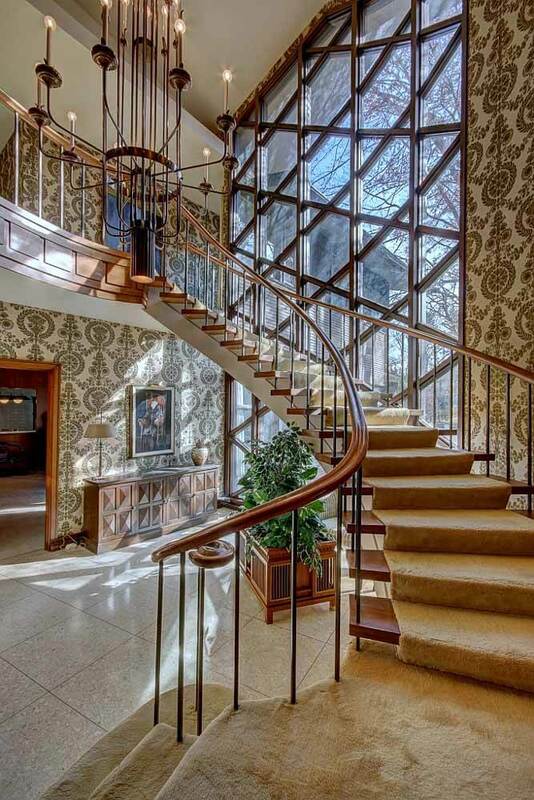 What a snazzy way to connect the spaces in a large, long room. This single family home located at 446482 E Fishermans Road, Gore, OK 74435 is currently listed for sale by C21/Wright Real Estate, with an asking price of $359,000. 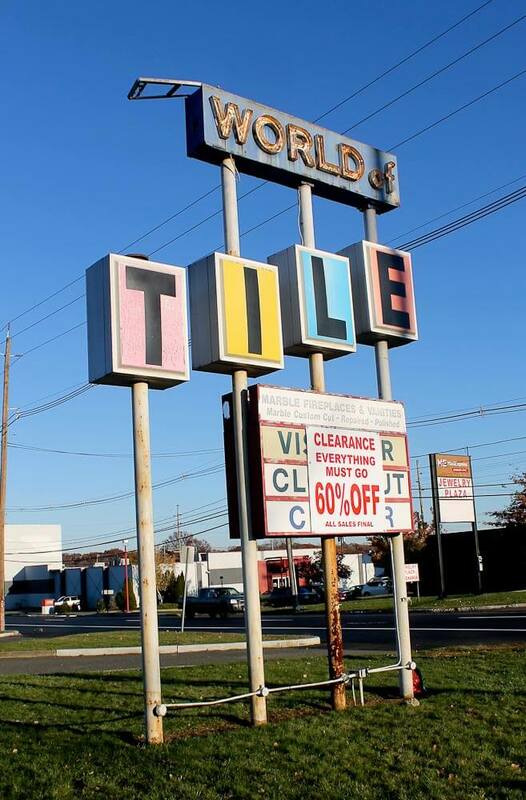 This 2,832 sq. 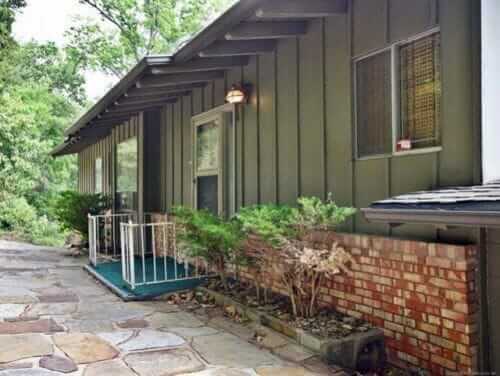 ft. property was built in 1960 and has 3 bedrooms and 3 full baths. Yes, listing agent and Realtor Wes Nofire says that the decor we are looking at was conceived by a professional decorator hired by the second owners of the house, who bought it in 1970. The design of the original house also is a marvel, he said: The first owner was a World War II naval veteran, and designed the house so that all the plumbing, electric, etc. were accessible from one space — like inside a battleship. 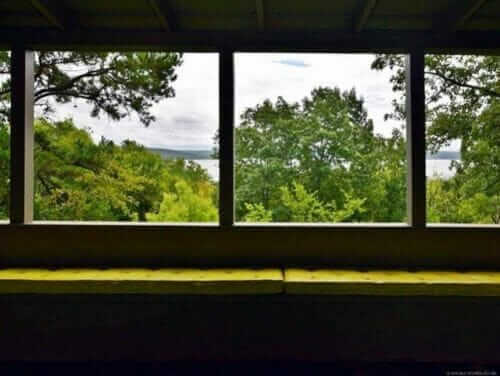 The home is three stories, with views to a nearby lake. 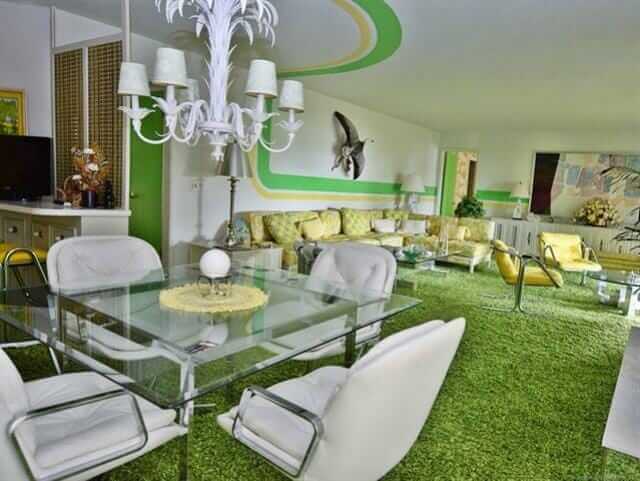 #2 (above): The color palette in the living room is tightly controlled — lime green, sunshine yellow, and white. Note the yellow-back-painted shelves. 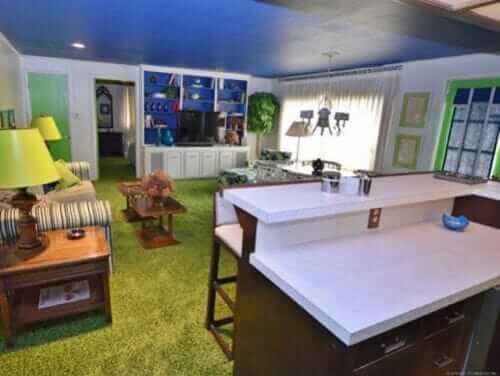 The carpet has a hint of avocado to mellow out and ground the space. Peek: Into the dining room. Looks like very metallic silver foil wallpapear in there. I don’t have a photo, but Wes says he may be able to send me one. 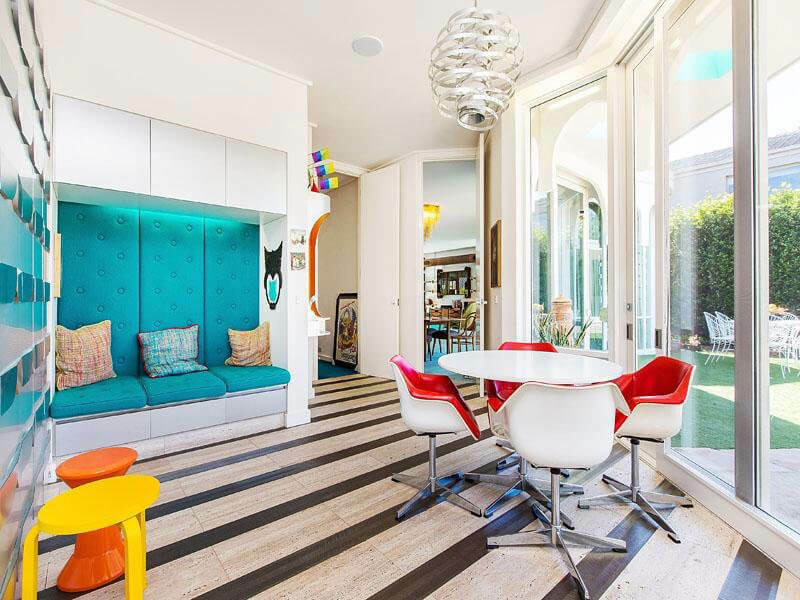 Wes, who took these photos and generously gave me permission to feature them, says the only thing that has been changed in the house is that some of the white leather upholstery was reupholstered over time. 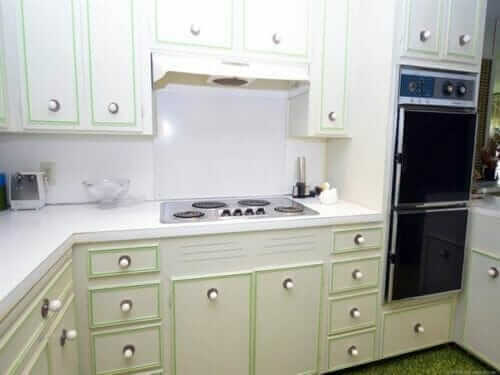 All the appliances are original and they all work, he says. #3 — The sectional is wonderful. Notice the sheer pinch pleats are layered over what appear to be woven wood shades ala Beautie Vue. #4 — Tiny stools tucked under the mirrored sofa table. The fireplace (toward the back of this photo) also appears to be mirrored. 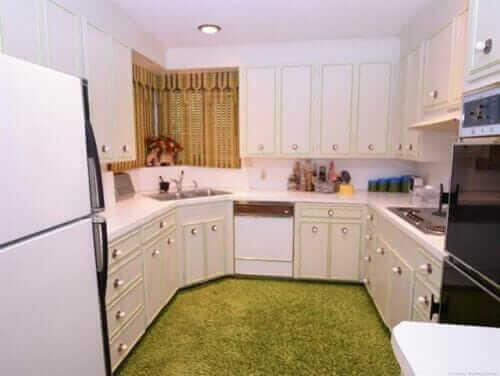 #5 — Yes, carpet in the kitchen. No comments, please. 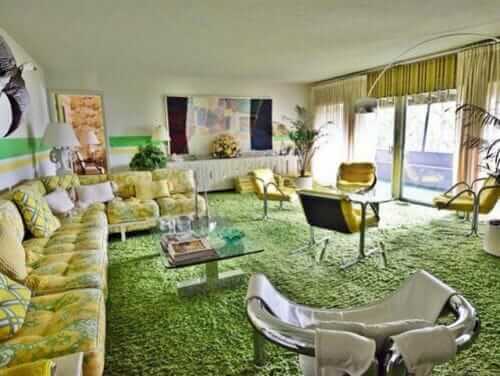 It was the 1970s. #6 — The cabinet door and drawer fronts have the look of some St. Charles’ I’ve seen, but I don’t think these are steel. #7 — I’m thinking this is a family room. 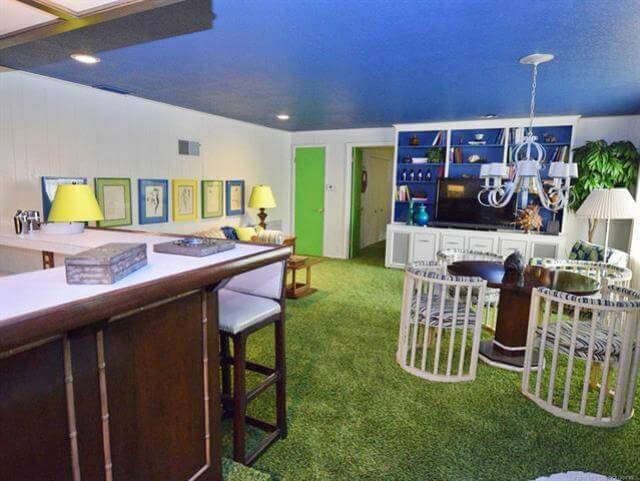 The color blue is now judiciously introduced — in the blue-painted ceiling, the back-painted cabinetry, the mats of the framed sketches above the sofa, and on the card-table chairs’ upholstery, methinks. Great card table chairs! #8 — I like how the doors are all painted. They are treated like geometric elements within each room, not whited out. 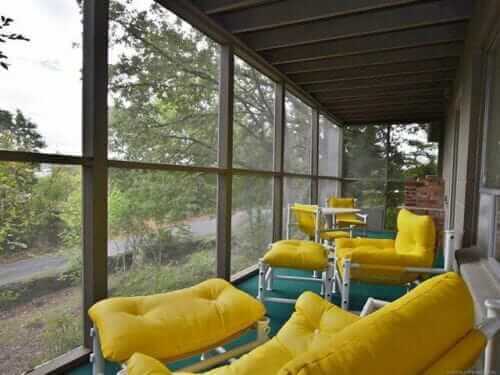 #9 & #10 — I’m thinking that all the living spaces are oriented toward the lake, with seating planned to enjoy the views. 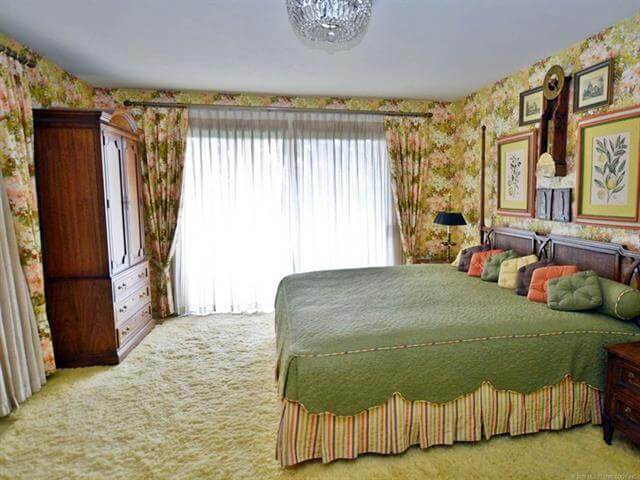 #11 — Fantastic master bedroom. Matching pinch pleat draperies and wallpaper… coordinated bedskirt and even piping. The little square pillows all in row == LUV. 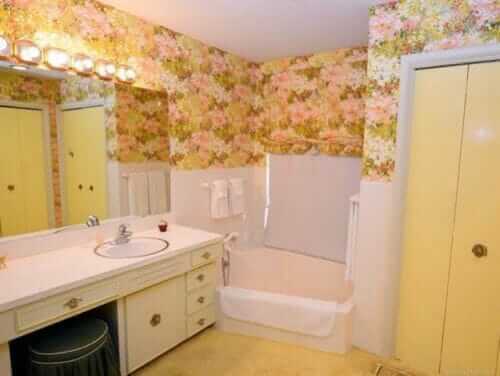 #12 — This bathroom goes with the master bedroom, same wallpaper. Again, I don’t wanna hear waah waahs, please, about the carpet in the bathrooms. It was the 70s. #13 — The yellow bedroom. 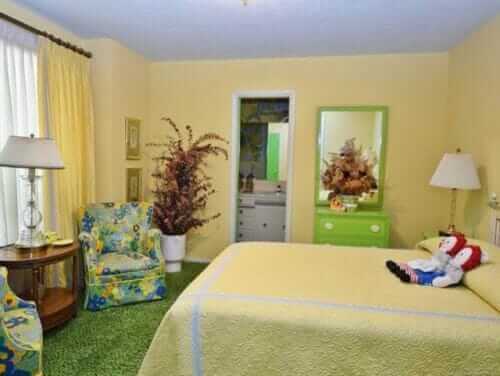 The lime green dresser reminds me of Drexel Plus One sans the words. Flower-powered wing chairs are my new everything. 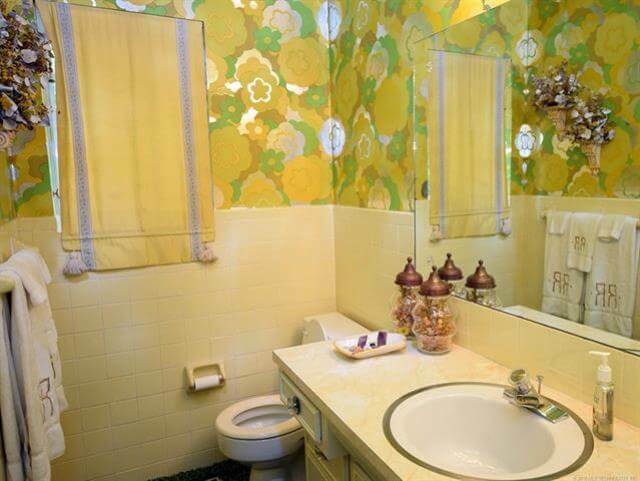 #14 — I *think* this is the bathroom that goes with the yellow bedroom. However, looking at photo #13, the wallpaper in the attached bathroom seems to match the wing chairs; I see blue. Me confused. P.S. Close yer toilet lids, people: Bad feng shui to leave them open, because your money energy is attracted to be flushed down that drain, and we don’t want that, do we? 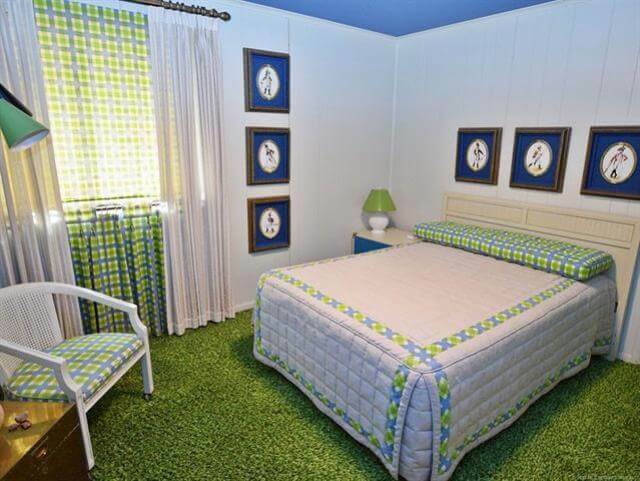 #15 — Every house needs a plaid bedroom. Notice: The window seems to be dressed with (1) sheer pinch pleats over (2) a plaid pull-down shade, which hangs over (3) cafe curtains that hang to ground, to line up with the pinch pleats. Now that’s attention to detail. #16 & #17 — You’d never know from outside, all the 1970s happy going on inside! 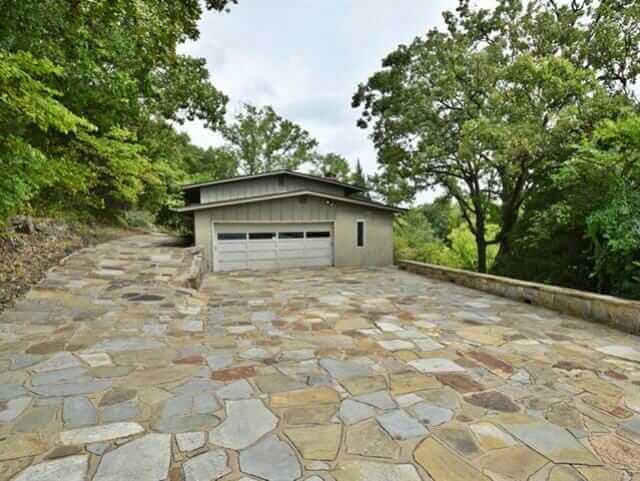 See our complete time capsule house archive — more than 100 houses! Big as a battleship, too! Love this place. 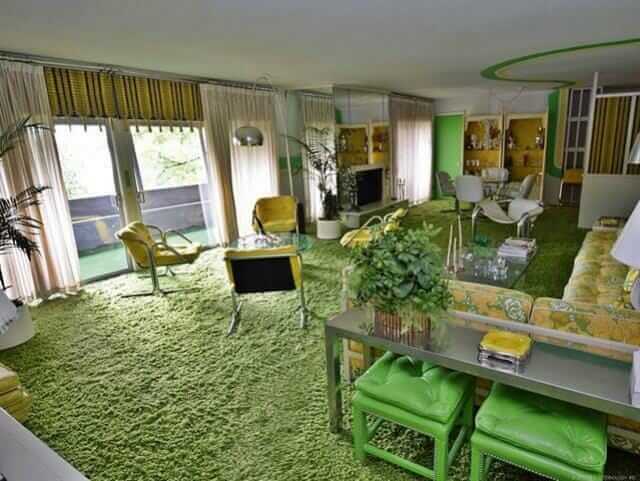 But green is not my color so will have to step aside and let someone else buy and love it. 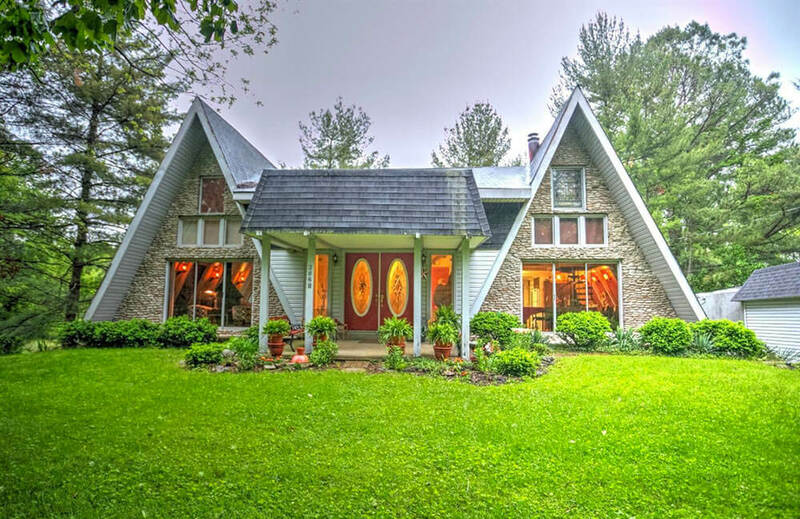 Thanks for sharing this great house. I’m trying to get pinch pleated draperies made for my 70s house, but it’s slow going. Wide fabric rare and unaffordable for me since US gave up the textile industry. Man oh man, i wish i could win the Mega-Millions lottery. I would buy this in a heartbeat. It is perfect through and through. My absolute dream house and i would not change a thing.